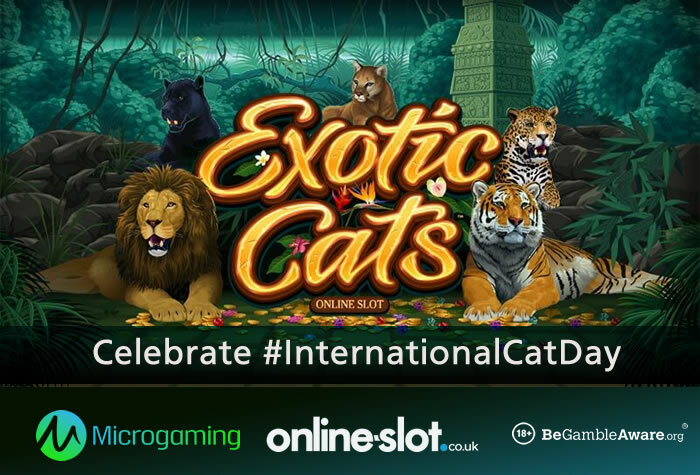 Today is International Cat Day and its only appropriate that Microgaming has unleashed the brand-new Exotic Cats slot. Exotic Cats celebrates big cats like tigers, lions, panthers, leopards and cougars – with 5 reels and 243 ways to win, you can spin away deep in the jungle from as little as 15p per spin on all devices. Beautifully designed, it comes with a Vertical Wilds feature. Each reel has its own exotic cat above it – when that cat lands on that reel, the reel becomes a wild reel. As Microgaming puts it, “the Vertical Wilds feature gives players the opportunity to earn some spectacular prizes in the exotic cats’ den, where up to 5 reels can be turned entirely wild by the powerful felines with a single swipe”. You can play Exotic Cats right now at CasinoRoom – with slots from NetEnt, WMS, Barcrest, Bally, Yggdrasil Gaming and Play ‘N Go, they have all the latest titles including NetEnt’s Swipe & Roll, WMS’ Volts & Bolts and Yggdrasil Gaming’s Penguin City. When it comes to signing up, you can get bonuses on your first 5 deposits. With a 100% bonus up to £50 or 200% bonus up to £200 on your first deposit, there’s up to £1,200 in bonuses up for grabs. They have impeccable customer support and process cashouts within hours with no fees whatsoever.